When Kavya Aswadhati first heard of the ICE raids in the Beach Flats neighborhood of Santa Cruz, she immediately thought of all the people she’d gotten to know working in the community garden and she placed a phone call. Aswadhati serves as a news director for the fledgling local news program at KZSC, the student-run radio station at UC Santa Cruz. But like many people at the radio station, she wears many hats, DJing for music programs, producing or participating in various talk radio programs, and filling in where needed. But the news program in particular is a point of pride for the students who run the radio station—February marked its one-year anniversary. KZSC, 88.1 on the FM radio dial, broadcasts 20,000 watts, which sends its signal across three counties—Santa Cruz, Monterey, and San Benito—and to cities like Watsonville and Salinas. The signal can even be heard in King City, more than 90 miles from campus. “Day one we get our reporters trained on the editing software, give them the equipment they need, and we put them on a story,” Corona said. Right now, the station produces enough stories for a 10-minute segment every Thursday at 8 a.m. Considering the time and care it takes to produce every minute of a quality radio news story Corona, Aswadhati, and others are satisfied with the current output but have an eye on expansion, hoping to add another full slate on Tuesdays. Rozendal earned a Ph.D. in social and political psychology from UC Santa Barbara and has volunteered at college and community radio stations in Texas, California, and Vancouver, Canada. Given that KZSC is 100 percent student-run, Rozendal facilitates the work of the 24-person governing board that is duly elected on an annual basis. So Corona is not merely the student figurehead, but runs the station through the governing board—fellow students who help her manage the various unwieldy aspects of a radio station that is broadly popular within the community as well as the friendly confines of the campus. Her team analyzes the $250,000 budget, sets the program schedule every quarter, and leads all the fundraising to keep the programs running while managing quality control on every front. KZSC raised more than $70,000 in donations last year, a record for the station. Among student-run groups on campus, KZSC generates the most gifts by far. But along with celebrating a year for the news station, KZSC is also preparing to celebrate 50 years of student-run broadcasting during Alumni Weekend in late April. Created in 1968, just three years after the university itself was founded, KZSC was initially called KRUZ. The studios were in the basement of Stevenson College dormitories. The station’s studios had relocated to the Communications Building on Science Hill by the time the FCC gave the station a toehold on the FM radio band, with a 10 watt signal at 88.1 FM. The studios moved to its current location above Crown College in 1980 and starting broadcasting at 10,000 watts in 2002 before amping up to its current 20,000 watts in 2007. But along with celebrating its technical evolution that has facilitated the station’s broad reach on California’s Central Coast, KZSC is reaching out to alumni and collect the stories of the innumerable students that passed the radio station—and its unique student-run culture—from one year to the next down through the decades. “We keep discovering amazing things about the people who passed through these doors, who helped make KZSC into something special,” Rozendal said as he digs through several boxes of fading paper files. 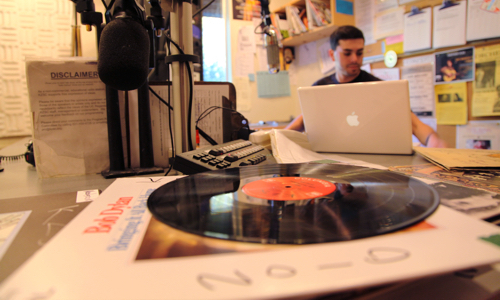 Those unorganized records have gradually yielded a directory of KZSC alumni, who have been invited back to the station’s 50th Anniversary celebration—set for Alumni Weekend April 27–29. Throughout the weekend, alumni programmers will return to the airwaves to spin some classics and share personal reflections about their glory days on the air. KZSC takes over the Quarry Amphitheater at 7 p.m. on April 28 to present a live radio variety show featuring personalities, artists, and other creative types who were part of the 50-year history of student radio at UCSC. It’s a free event, open to the public to celebrate KZSC’s mission and history. A Sunday brunch, by invite only, will celebrate the more than 40 year history of the Women’s Radio Collective—currently broadcasting as Breakfast in Bed, Sundays at 9 a.m. on KZSC.